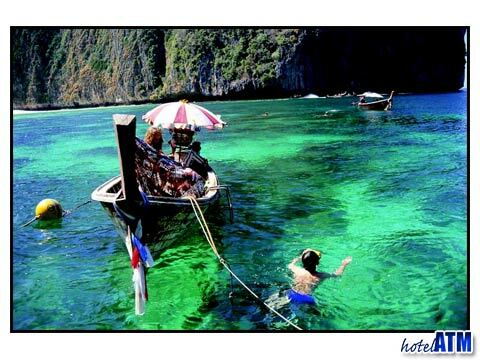 Most of Phi Phi Island's inhabitants use longtail boats to get around. Most of the island is cliff or mountain. There are a few farmers with crops on the flatter slopes but this means that there are few trails. The birds nest farmers scale the cliffs but their routes could hardly be called trekking. The classic view of Phi Phi Island is from the Viewpoint. This route takes you up through the back of Phi Phi Don Village near PP Phitarom Resort to a set of steep concrete stairs that go up at a steep 30-40 degrees for 100 m. After you reach the end of the concrete the trail is of a gradient where a motorbike and side car can drive all the rest of the way to the viewpoint, probably another 500 meters. The views from the viewpoint are spectacular. 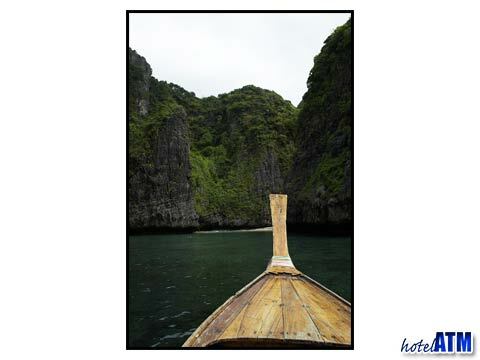 Here you can sea the famous dumbbell shape of Tonsai and Loh Dalum bay with the cliffs of Phi Phi Don framing behind. The sun is on the cliffs in the morning before 11. Sunset most nights is about 6.30. Up behind the Phi Phi Don Village reservoir there is a concrete road that goes up past Bamboo Mountain Resort and up to the Tsunami Village, a village built by the Thai government to house those who lost their houses in December 2004. Just before you get to the village, no more than 100 meters before the community center you find a track to the left. Just follow the electric poles. Behind the Classic viewpoint described above there is a small snack bar called Co Co s where you can grab a drink. From here it is just 10 minutes to the summit, a viewpoint with stunning views of Bamboo Island and Krabi province to the east and and even more dramatic viewpoint of Tonsai, Loh Dalum and the cliffs to the west. Very cool. Just 35 minutes along the beach track and coastline is long beach where two simple sets of bungalows command fantastic views of Phi Phi Ley. The cliffs of Tonsai Bay come alive at about 6.30 as the rising sun shows their full glory. The reef is only 10 meters away from The Beach Club so be prepared to swim.